The game had a very big importance for second-ranked Al Shamal as it allowed them to take a leadership position. Al Shamal defeated one of their biggest challengers Qatar Sports Club in Doha 73-65. It ended at the same time the nine-game winning streak of Qatar Sports Club. It was a key game for the top position in the league. Al Shamal had a 37-23 advantage in offensive rebounds. Worth to mention a great performance of Algerian forward Mohamed Harath (198-90) who helped to win the game recording a double-double by scoring 17 points, 15 rebounds and 5 assists and Georgian Mikhail Berishvili (204-87) who added 14 points, 9 rebounds and 6 assists during the contest. The best for the losing side was American guard Jeff Newberry (188-92, college: Oklahoma St.) with 26 points and 6 assists. As mentioned above they are alone now at the top position. Qatar Sports Club at the other side keeps the third place with three games lost. Qatar Sports Club will play next round against Al Rayyan trying to get back on the winning streak. It will be a derby game for which supporters look forward to, where their team will face at home their local rival from Doha - Al Rayyan. Al Shamal will have a break next round, and it should allow them to practice more before next game. Another interesting game was a derby match between two teams from Doha: Al Sadd (#3) and Al Ahli (#7). Al Sadd (9-2) won against visiting Al Ahli (4-8) 83-70. It ended at the same time the two-game winning streak of Al Ahli. The winners were led by American point guard Dominic James (180-86, college: Marquette) who scored that evening 26 points, 5 rebounds and 8 assists and Miroslav Todic supported him with 21 points, 7 rebounds and 4 assists. Even 19 points, 6 rebounds and 6 assists by American Julius Coles (193-89, college: Canisius) did not help to save the game for Al Ahli. Al Ahli's coach Panagiotis Foteinakis rotated twelve players in this game, but that didn't help. Al Sadd moved-up to second place. Al Ahli at the other side keeps the seventh position with eight games lost. Al Sadd's supporters look forward to another derby game next round, where their team will face at home their local rival from Doha Al Gharafa. Sixth ranked Al Gharafa (5-6) beat at home 8th ranked Al Khor (1-10) by 15 points 99-84, which is the biggest margin this round on Saturday night. The best player for the winners was Franklin Session who scored 48 points (!!! ), 8 rebounds, 6 assists and 4 steals. At the other side the best for losing team was Aladji-Bobo Magassa who recorded a double-double by scoring 18 points and 11 rebounds. Al Gharafa maintains sixth position with 5-6 record. Al Khor lost sixth consecutive game. They keep the eighth place with ten games lost. Al Gharafa's supporters look forward to an exciting derby game next round, where their team will travel locally in Doha to the arena Al Sadd. Another interesting game was again a derby between two teams from Doha: Al Arabi (#4) and Al Rayyan (#9). Al Rayyan was defeated at home 71-82 and even the fact of playing on their own court did not help. It was a good game for Oumar Seck who led his team to a victory with a double-double by scoring 19 points and 10 rebounds. Defending champion maintains fourth position with 7-5 record. Al Rayyan at the other side stay at the bottom place with 11 games lost. Al Arabi's supporters look forward to an exciting derby game next round, where their team will face at home their local rival from Doha Al Ahli. Another interesting game was a derby match between two teams from Doha: Al Sadd (#3) and Al Ahli (#7). Al Sadd (9-2) won against visiting Al Ahli (4-8) 83-70. It ended at the same time the two-game winning streak of Al Ahli. Al Sadd players were unselfish on offense dishing 21 assists. The winners were led by American point guard Dominic James (180-86, college: Marquette) who scored that evening 26 points, 5 rebounds and 8 assists and Bosnian-Serbian power forward Miroslav Todic (205-85) supported him with 21 points, 7 rebounds and 4 assists. Even 19 points, 6 rebounds and 6 assists by American Julius Coles (193-89, college: Canisius) did not help to save the game for Al Ahli. Seydou Ndoye added 16 points and 9 rebounds. Four Al Ahli players scored in double figures. Al Ahli's coach Panagiotis Foteinakis rotated twelve players in this game, but that didn't help. Al Sadd moved-up to second place. Al Ahli at the other side keeps the seventh position with eight games lost. Al Sadd's supporters look forward to another derby game next round, where their team will face at home their local rival from Doha Al Gharafa. The game had a very big importance for second-ranked Al Shamal as it allowed them to take a leadership position. Al Shamal defeated one of their biggest challengers Qatar Sports Club in Doha 73-65. It ended at the same time the nine-game winning streak of Qatar Sports Club. It was a key game for the top position in the league. Al Shamal had a 37-23 advantage in offensive rebounds. Worth to mention a great performance of Algerian forward Mohamed Harath (198-90) who helped to win the game recording a double-double by scoring 17 points, 15 rebounds and 5 assists and Georgian Mikhail Berishvili (204-87) who added 14 points, 9 rebounds and 6 assists during the contest. Four Al Shamal players scored in double figures. The best for the losing side was American guard Jeff Newberry (188-92, college: Oklahoma St.) with 26 points and 6 assists and his fellow American import forward Aaron Rountree-III (203-93, college: Iona) scored 18 points, 9 rebounds, 5 assists and 5 steals. As mentioned above they are alone now at the top position. Qatar Sports Club at the other side keeps the third place with three games lost. Qatar Sports Club will play next round against Al Rayyan trying to get back on the winning streak. It will be a derby game for which supporters look forward to, where their team will face at home their local rival from Doha - Al Rayyan. Al Shamal will have a break next round, and it should allow them to practice more before next game. Another interesting game was again a derby between two teams from Doha: Al Arabi (#4) and Al Rayyan (#9). Al Rayyan was defeated at home 71-82 and even the fact of playing on their own court did not help. Al Arabi dominated down low during the game scoring 62 of its points in the paint compared to Al Rayyan's 38. Their players were unselfish on offense dishing 24 assists. It was a good game for Senegalese center Oumar Seck (208-88) who led his team to a victory with a double-double by scoring 19 points and 10 rebounds. American-Iraqi point guard Kevin Galloway (200-88, college: Texas Southern) contributed with 13 points, 7 rebounds and 8 assists for the winners. Four Al Arabi players scored in double figures. American Lenny Daniel (203-87, college: CS Northridge) replied with 27 points and 8 rebounds and his fellow American import swingman Akeem Wright (200-84, college: Kansas St., agency: Octagon Europe) added 17 points and 8 rebounds in the effort for Al Rayyan. Defending champion maintains fourth position with 7-5 record. Al Rayyan at the other side stay at the bottom place with 11 games lost. Al Arabi's supporters look forward to an exciting derby game next round, where their team will face at home their local rival from Doha Al Ahli. Sixth ranked Al Gharafa (5-6) beat at home 8th ranked Al Khor (1-10) by 15 points 99-84, which is the biggest margin this round on Saturday night. Al Gharafa made 24-of-28 free shots (85.7 percent) during the game. The best player for the winners was American guard Franklin Session (187-89, college: CS Los Angeles) who scored 48 points (!!! ), 8 rebounds, 6 assists and 4 steals. The other American import forward Nick Stover (198-93, college: S.Alabama) chipped in 22 points and 9 rebounds. 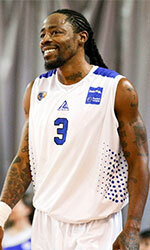 Stover is a former Eurobasket Summer League player, which is considered top international summer league in the market. At the other side the best for losing team was Aladji-Bobo Magassa who recorded a double-double by scoring 18 points and 11 rebounds and American forward Da'Quan Cook (205-87, college: St.Bonaventure) added 17 points and 9 rebounds respectively. Four Al Gharafa and five Al Khor players scored in double figures. Al Gharafa maintains sixth position with 5-6 record. Al Khor lost sixth consecutive game. They keep the eighth place with ten games lost. Al Gharafa's supporters look forward to an exciting derby game next round, where their team will travel locally in Doha to the arena Al Sadd.